Trabolgan Holiday Village just got even more exciting! Your children will be delighted to meet their favourite PJ Masks characters at Trabolgan Holiday Village, where they will be joining us this year. Catboy, Owlette and Gekko are the latest addition to our friendly children’s entertainment team, swooping into action at night to solve the mysteries that arise during the day. They’re on a mission to make things right for everyone, and they’re sure to bring smiles to all the young visitors to Trabolgan this season. We know you’ll have a great time at Trabolgan, and our free entertainment for adults and children ensures that there is something for everyone in the family. The highlight of the programme for children will be our fantastic Woodland friends and their PJ Masks pals, and we also have a good variety of activities for everyone, including quizzes, bingo, cabaret acts and a great line up of live bands throughout the season. Catboy. He’s fast, he’s agile and he can hear the smallest sounds across unbelievable distances. Catboy is the leader of the trio and can outrun anyone! You’ll hear him shout ‘Super Cat Speed’ as he leaps into action and goes all out for adventure. Owlette. With super powers that include taking flight, Owlette is a hero to watch out for. She’s got the sharpest of owl eyes and a quick mind that keeps her ahead of the rest, and her wing wind is a weapon to behold! Gekko. Gekko is the youngest of our heroes, but he is a strong and sticky master of camoflage, ready to rush into danger and save the day. He’s great at climbing and has an amazing strength that sees him triumph every time. 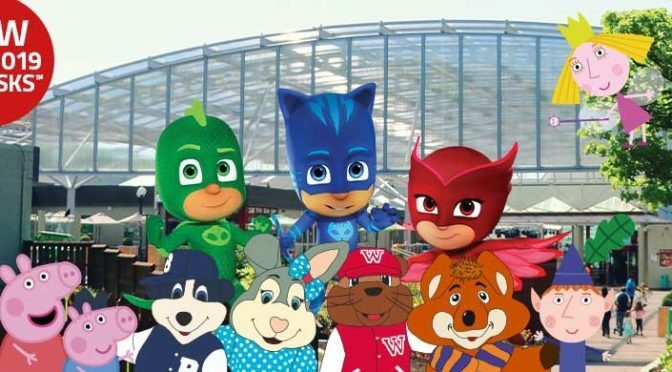 Your children will love the opportunity to meet the PJ Masks cartoon characters live at Trabolgan, and the characters may inspire them to try our fantastic range of sporting activities too. They’ll love to flex their own superhero muscles as they climb, run and swim their way to the best holiday they’ve ever had. All entertainment is free to resident guests. Here at Trabolgan Holiday Village, our new covered plaza area is perfect for all weather fun, so you can enjoy your break without worrying about the rain. Our luxurious self catering accommodation is perfect for your family break, with fully equipped kitchen and attractive decor, and if you prefer to eat out, we have an excellent range of entertainment and dining venues on site, too. We know that parents are much more likely to have a relaxing holiday when their children are busy and happy, and we know that your little ones will love our new additions to the team this year. Call our reservations team on +353 (0) 21 4661551 or visit us online now.